Today I installed Ubuntu 9.04 Netbook Remix on my Acer Aspire One. I was pretty impressed. The only thing I really had to select during the installation other than the partitions to install it in (only because I've left the original XP OS intact and bootable) was the English keyboard layout. 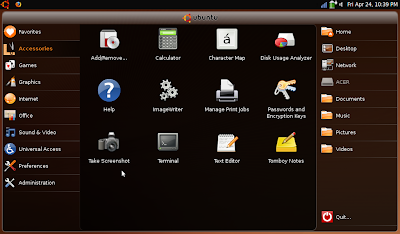 They've really gone a long way toward making Ubuntu really simple to install and use. Everything pretty much worked right after the install. I didn't have to mess with the wireless card drivers or setup... it all just worked. The camera worked. The sound worked. Nice. The screenshot above is the Netbook Remix "desktop". It makes most things easy to see and access on the smaller screens of the netbooks and other devices. You can still switch to a more traditional desktop but I don't see having to do that very often. I've used Apple Macintosh computers at home since 1986 or so. I still want to replace my old G4 with something (the Aspire One I'm typing this on is faster than my desktop machine currently is) but the more I use Ubuntu the less I really want to pay more $ for a new Mac. I know I can go to the Apple Store and play with a MacBook for about 10 minutes and I'll be back in the Mac camp again but Ubuntu does gradually pull me over to the side from time to time. I'd still have a problem setting up and leaving a Linux box (even if it is Ubuntu) with someone who isn't really "terminal savvy" or just a general geek. The Mac still wins in that situation. For those who don't mind the occasional adventure into the land of the terminal prompt but really just want an easy to use system, Ubuntu really does have the answer. I ditched Netbook Remix after about a week and went with a normal desktop install. Whenever I opened a new window with netbook Remix regardless of which desktop I was using I was getting huge windows that take up the whole screen even when they don't need to. I guess I'm too used to using a normal windowed environment on the Mac and on Windows. I still think the Netbook Remix looks really slick and is still a great alternative for some. In any case I'm perfectly happy with the current 9.04 desktop and I'm still thinking about building an Ubuntu machine for my desk at home rather than upgrading to a new Mac. At least it's out of the road now. 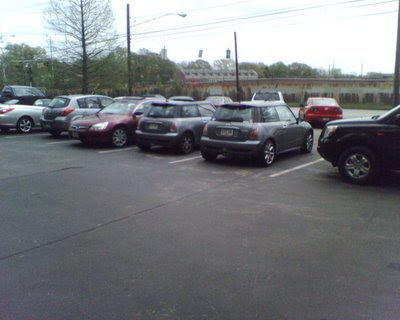 Parking for dark silver Cooper S's right up front at Fox Bros. B-B-Q! We went there for the fried pickles which were quite tasty (they use chips, not spears.) The pulled pork sammich and Brunswick stew were really good too. Normally I add some hot sauce to my stew to kick it up a bit but that wasn't necessary here. Heather wants to go back for The Tomminator. It turns out that Maxwell really had been sick lately. Tuesday morning the electrical system totally died on the way to work. I barely made it back to the house. The trouble was with a bad alternator. The diagnosis was made easier when it started smoking while the fine folks at Way Motor Works were checking it out. When I picked Maxwell up Friday I also picked up a Scanguage II. I've been looking at it for a while. If I had got it earlier I'd probably been able to tell that something was up with my charging system among other things. 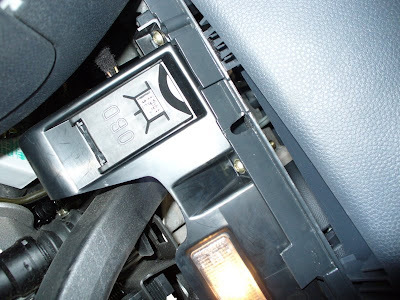 It's a tiny computerized guage that connects to the OBD II socket of the car. It can read all kinds of info from the car's ECU. It's also a trip-computer that's similar to what's on the cars these days but a few steps better. 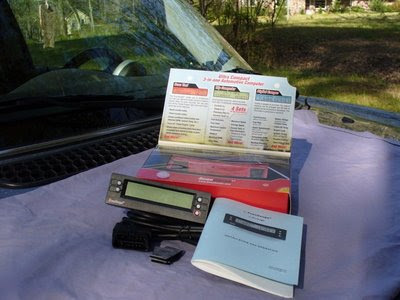 It comes with the gauge, an OBD II connector cable, some Velcro and a manual. 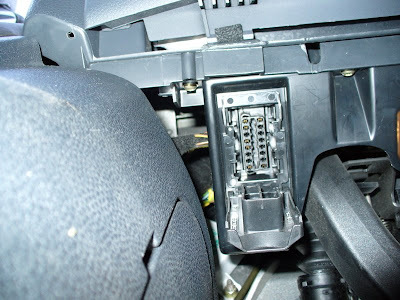 Here's the OBD II connector... under the steering wheel. It's the same connector that they hook the computer up to for emissions testing. Just open it up and plug the cable in to the socket. Voila! It's reading stuff. I'm idling in the driveway going nowhere. Still idling.. going nowhere. But my alternator is working! Wow... the water temp really does go up quickly when you're going nowhere. I went to the gas station and topped off. This will enable the ScanGauge to compute a correction factor for the amount of fuel used next time (and every time) I fill up. It's also set to the fuel tank size so it should give me a "time until empty". 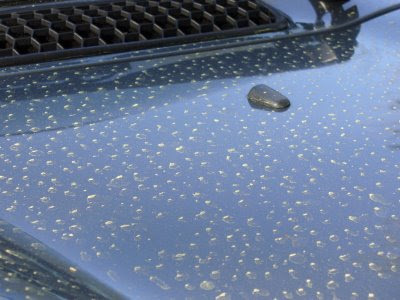 The car does this too so I'll have to see how they compare. After this I ran a few errands and went to the grocery store. It's mounted with the Velcro on the dash. I had to move the GPS over a little bit but not too much. 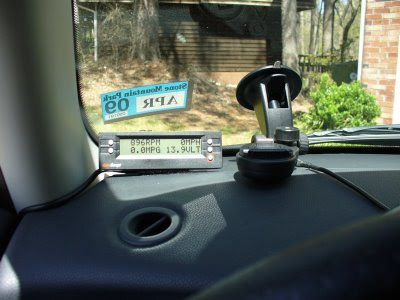 I also checked the speed reading of the ScanGauge against the speed reading of the GPS. They were pretty close. I did make a small adjustments as the ScanGauge often seemed a little fast. Here's my mileage from my running around today. 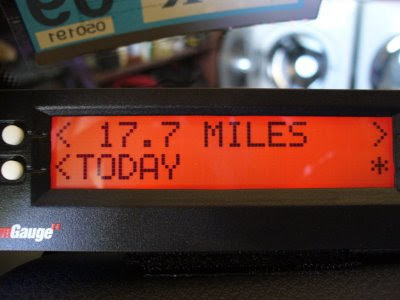 It keep trip counters for a single trip, the current day, the previous day and the whole tank. You can also set the price of your gas when you fill up so it will compute how much your trips cost you. It has a backlight that can be programmed to be 90-something different colors. Looks like their "amber" is already a close match for the rest of my dash instruments. Yay. I'll report back later after I used it for a while. All in all it's a handy little tool. In addition to the gauge values it already reads, it's programmable so you can add more when you encounter new ones or car-specific ones. 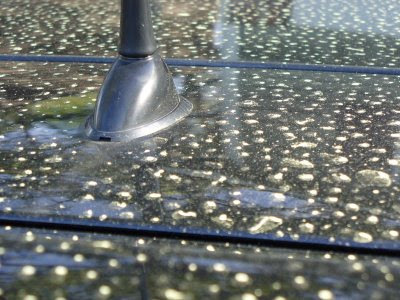 It will also read the fault codes when the SES and other strange lights in your car come on. It can also clear them once the issue has been addressed. It definitely appeals to my inner-geek.